Kafka is used for building real-time data pipelines and streaming apps. It is horizontally scalable, fault-tolerant, wicked fast, and runs in production in thousands of companies. TopicName: test-kafka Partition:0 Offset:5 Msg:The 2 times to say hello kafka! TopicName: test-kafka Partition:0 Offset:6 Msg:The 4 times to say hello kafka! TopicName: test-kafka Partition:0 Offset:7 Msg:The 6 times to say hello kafka! TopicName: test-kafka Partition:0 Offset:8 Msg:The 8 times to say hello kafka! TopicName: test-kafka Partition:0 Offset:9 Msg:The 10 times to say hello kafka! TopicName: test-kafka Partition:1 Offset:5 Msg:The 1 times to say hello kafka! TopicName: test-kafka Partition:1 Offset:6 Msg:The 3 times to say hello kafka! TopicName: test-kafka Partition:1 Offset:7 Msg:The 5 times to say hello kafka! TopicName: test-kafka Partition:1 Offset:8 Msg:The 7 times to say hello kafka! 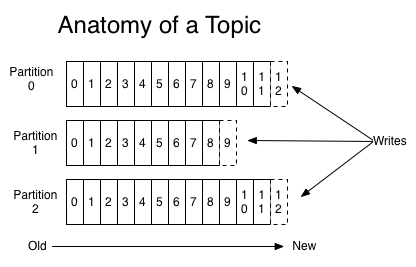 TopicName: test-kafka Partition:1 Offset:9 Msg:The 9 times to say hello kafka!